Obama has been called a savior and compared to Jesus for years, but let’s take a look at some of the more recent examples. At the Soul Train Awards in November, comedian Jamie Foxx said in his opening statement “First of all, give honor to God and our lord and savior Barack Obama.” Yes, he called the President of the United States “our lord and savior.” Then, in January, Newsweek Magazine ran a cover with a photo of Obama and the caption “The Second Coming.” Again, a comparison of Obama to Jesus. Conservatives were up in arms, but we heard nothing from America at large, and nothing from Obama to dispute this characterization. 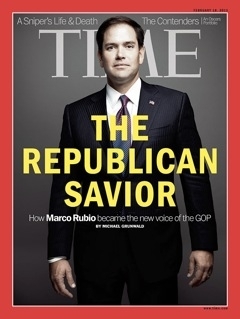 Now we have Marco Rubio on the cover of Time Magazine with the headline “The Republican Savior.” Rubio immediately took to Twitter, saying that “There is only one savior, and it is not me. #Jesus.” Why such a vastly different response to the two covers by the subjects themselves? Have Americans become so dependent on government that they have replaced depending on the strength of a higher power with depending on the government to fulfill one’s every need? I think the response to the assertion that one is a modern-day savior can tell a person quite a bit about that person’s view on the role of government in society. 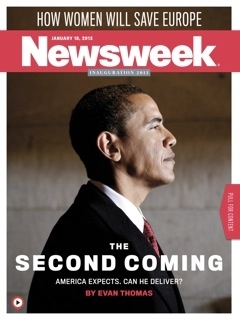 I’m not suggesting that Obama believes himself to be the Messiah, but I think it’s highly likely that he sees himself as saving us or, at the very least, believes that it is the president’s job to do so. Cradle to grave government programs now take the place in society that churches, families and community organizations used to hold. Liberals look to the government to save them from everything from the unfair nature of life in general to the cost of birth control. Rubio, on the other hand, sees government as something that smooths the path for people to succeed on their own, with hard work, determination and faith. Conservatives don’t want to be saved by government and that, my friends, is the fundamental difference. Obama knows enough about the Bible to use it to his benefit and that also means he knows that for people to call him "Lord and Savior" is nothing short of blasphemy. For him to accept that designation by not correcting it is just as wrong and, for him and his followers who believe that he is the "lord and savior", it is dangerous. God will not be mocked. Obama thinks he is the savior, that's why he does not dispute it. Really big EGO. Ah yes... the good ole' "Messiah" and savior comments. The ONLY people who make such comments are on the extreme right. Meaningless drivel. Keep it up. The GOP lost for a reason and most of it was from silliness like this. You did see the quote from Jamie Foxx right? Left wingers think that government is their salvation and the latest democrate is the savior, nothing new. The steps the administration had taken to rein abuse of civil asset forfeiture were undermined on Wednesday when President Barack Obama signed an executive order that ignores Fifth Amendment protections for due process, authorizing the seizure of property from those who are merely suspected of cyber-crime. Whew, it’s been a tough week. Looking back on the last five years and all the harm ObamaCare has done to this country is a real downer. In order to head into the weekend on a slightly lighter note, let’s conclude our series with a little frivolity, the five best quotes about ObamaCare. On multiple occasions over the last few years, President Barack Obama has reminded voters that he won't appear on the ballot again. Indeed, our long national nightmare will come to an end in 674 days. Presidents, of course, tend to engage on policy and politics even after they leave the White House. There's no reason to believe Obama will be any different. As we prepare for yet another State of the Union address filled with promises and pledges to the American people, the folks over a Grabien have pieced together a nearly 13-minute montage of the 112 promises that President Barack Obama made in his previous addresses to joint sessions of Congress but never kept. President Barack Obama faces a Republican-controlled Congress that opposes most, if not all, of his legislative agenda. And with just two years left in his presidency, he staring down irrelevance, without many, if any, real legislative accomplishments embraced by the American people. In some way, these sorts of problems can be liberating, but, as he so frequently tells Republicans, there is still an expectation that he live in some sort of a reality.